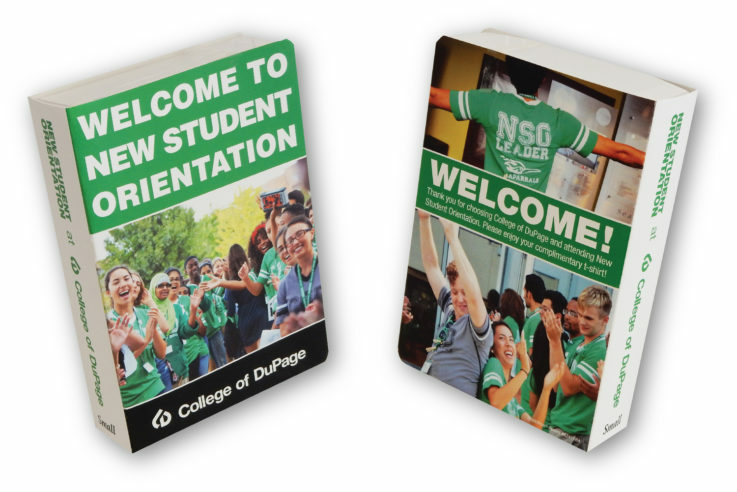 When it comes to college orientation giveaways, say “WELCOME” to new students in a BIG way. Hundreds of colleges and universities customize BookWear® with a big “Welcome” on the book cover. The college orientation giveaways look like a book but has a surprise inside, a t-shirt with the campus logo. Or it can be 30 other surprise gifts for students. Many of these schools also put a “Congratulations on Your Acceptance” message on the back of the book. It can be for Orientation, general admissions, or any department (Law School, Medical School, English Department, etc.) on campus that is marketing or recruiting and wanting to communicate in an effective way. Have fun and be creative with communications with BookWear®. It’s a short story that lasts a long time! “Judge for Yourself” is the title of this “book” for UNC Law Department. It’s a recruiting piece that is mailed out first class like a thick postcard. This book opens with a big smile on the cover, “Welcome to UNC Law!” is on the spine and Important Dates for application, orientation and first day of classes are listed on the back. It’s concise, well designed and professionally presented, like a legal case should be! Inside was a “UNC Law” T-shirt to spread the smiles and team spirit even farther. A great communications piece for a new student. Universities want top students so competition is fierce for those young adults. One father told us he saved all the recruiting material his daughter received and it totaled 40 pounds. “BookWear® would stand out in that pile” he said. It does. Baruch has recruited with this little BookWear and a T-shirt inside for eight years. Hundreds of colleges use BookWear® for college orientation and recruiting and they do it year after year. Admissions offices mail thousands of them like thick postcards to accepted or prospective students. The open rate is huge. And when students put the shirt on they are walking advertising to their peers. “We get a higher yield with BookWear® than with any other communications” says Case Western Reserve University. Get on this great bandwagon and visit your college admissions and recruiting offices. Every office on campus (Alumni, Medical School, English department, College Housing, etc.) can use this “book” for effective marketing, recruiting, fundraising, and college orientation. College orientation giveaways for empower a university’s recruitment strategy and stimulate potential to acquire quality students. They’re also the ideal college giveaways for students who have already been accepted. Not only to send a welcoming message to new college students during orientation, but they help students feel at home. The most powerful college orientation giveaways are not only practical items that are useful for campus living, but they’re surprising and meaningful giveaways that contain inspiring, uplifting, and motivating messages. 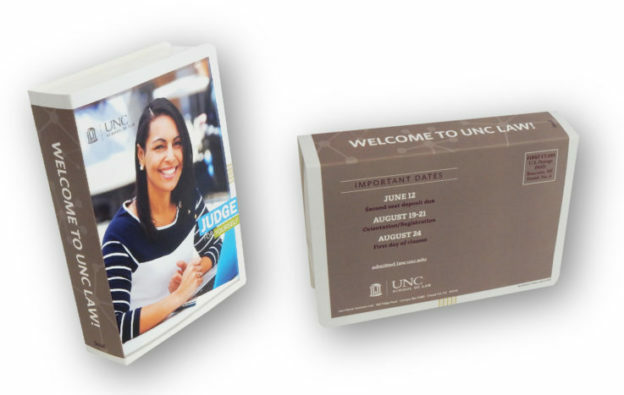 If something like this seems like the ideal giveaways to help support an upcoming college student orientation, then consider BookWear® to be one of the best investments you’ll ever make. Unlike other college recruiting giveaways, BookWear® is a tangible and dimensional concept that offers limitless ideas to make novel impression. The cover is customized with your graphics and your unique message. Combined with the element of surprise, BookWear® is a compelling form of communication that cannot go overlooked. Traditional college recruiting giveaways are often stale and all too common, thereby lacking novelty, excitement, and effectiveness in their purpose. To truly connect and resonate with your target audience, you need some creative, unique, and interesting. BookWear® offers the foundation to make a meaningful connection, enabling you to get your message across in an amusingly offbeat way. So don’t settle for generic recruiting giveaways. Strike a chord with each and every recipient, and invoke feelings of inspiration and enthusiasm for your cause by using BookWear®. Inside BookWear® is a surprise giveaway which can be a number of useful items that college students will love, like compressed t-shirts, laundry bags, sunglasses, socks, and more. But what makes BookWear® truly better than most college student giveaways is that it can be custom-tailored with any logo, design elements, messaging, and more. Choose from 24 awesome gifts to go inside BookWear®. Mail your college recruiting giveaways to students like a thick post card. You can do the mailing yourself or let our experienced team here at BookWear® handle the process for you. Our goal is to fulfill every order with 100% customer satisfaction. For more ideas, see University & College Case Studies.